The peaceful mountain village of South Park is burning. War is upon its people. The school is destroyed. When the call for a savior comes, young would-be hero Kyle Broflovski steps forward. His erstwhile companion Eric Cartman stares at him. "Jews can't be saviors." So yes, South Park: The Stick of Truth is going to be very much like the South Park you know - crass, irreverent, and hilarious. Series creators Matt Stone and Trey Parker took the stage at Microsoft's E3 2012 conference and spoke a bit about the game (and poked a little fun at Microsoft as well). 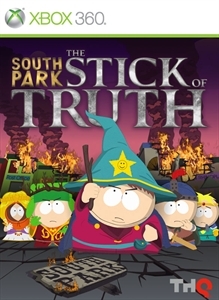 Developed by Obsidian, The Stick of Truth puts the players in the shoes of a new kid who has just moved to South Park and tries to become the fifth member of the core foursome. Possessing a special power, your new kid - who will be fully customizable in the trademark South Park look - must join Kyle, Stan, Cartman and Kenny to save the town. One of the difficulties, said Parker and Stone, was that in the 15 years of making South Park they'd never once mapped out the town. So when the game called for the player to go from Kyle's house to the school, they had to draw maps of South Park from scratch. The Stick of Truth will bring back crab people, Jesus, the marauding Mongolians, and the boys' anime-esque ninja alter egos among other fan favorites. Attacks will include lit farts. It was also the single best part of Microsoft's E3 conference. Don't deny it, you know it's true.